A stowaway mouse sent straphangers scrambling up their seats Wednesday after it was spotted hitching a ride on a packed train. The mouse had crept onto the E train headed to Jamaica Center at about 5:30 p.m. Wednesday, witness Augustus Balasubramaniam said. "A couple of minutes into the ride and after the train left Queens Plaza, I heard screams through my head phones," he said. "And then noticed people were actually standing on the seats. I took my headphones off and heard every one shout out “there’s a rat….there’s a rat”"
Video captured the commotion the tiny rodent caused. Several passengers had leaped onto their seats, and one woman was trying to scale the walls to get even further away. 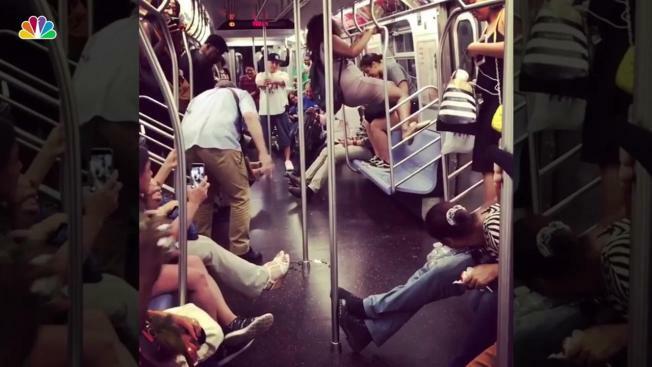 Many commuters were holding their feet off the ground, and some were screaming with fear - or glee. "By the next stop, Roosevelt Island, many of the people on the carriage got off and ran to other carriages, and it pretty much emptied up," Balasubramaniam said. "The remaining 'brave' folks, waited on the carriage…..and that's when I managed to get the video."